Manufacturers of heating and cooling equipment express air exchange capacity in Cubic Feet per Minute (CFM), but this number varies according to the temperature and pressure of the air being exchanged. Partly for the sake of comparing products, manufacturers sometimes express capacity in Standard Cubic Feet per Minute (SCFM), which assumes a standard temperature and pressure. If you have an application that calls for a certain capacity at a specified temperature and pressure, and the capacity of the system you are considering lists capacity in SCFM, you need a way to convert between CFM and SCFM. An expression derived from the ideal gas law allows you to do that. What Are CFM and SCFM? Volumetric air flow is measured in cubic feet per minute, but because the density of air and other gases changes with temperature and pressure, this number varies. 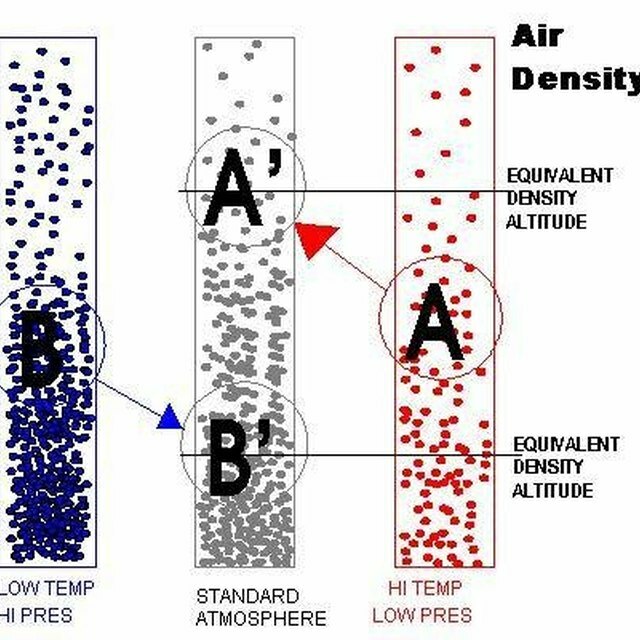 Density varies directly with pressure and inversely with temperature. Engineers often refer to CFM as Actual Cubic Feet per Minute (ACFM) to underline the relationship between airflow and air density. When the capacity of a heating or cooling unit is expressed in SCFM, these are the conditions the value assumes. The ideal gas law, pV = nRT, gives us the relationship between pressure, volume and temperature of an ideal gas, where n is the number of moles of the gas and R is a constant. Air isn't an ideal gas, but we can get a useful comparison between SCFM and ACFM by considering it as such. For the purpose of this calculation, m denotes the mass of the gas, which gives an expression for density (d), which is defined as the mass of the gas per unit volume (m/V); d = m/V = P/RT. Isolating the mass of the gas being moved (m) and dividing by the time it takes to move it gives the following expression: m/t = d(V/t). In words, the mass flow rate equals density multiplied by the volumetric flow rate. Tutco/Farnham: SCFM, CFM What’s the Difference? Deziel, Chris. "How to Convert SCFM to CFM." Sciencing, https://sciencing.com/convert-scfm-cfm-6156309.html. 13 March 2018.